“Reality is what we make it,” Mark Carp in Naomi’s “AMERICAN” FAMILY. 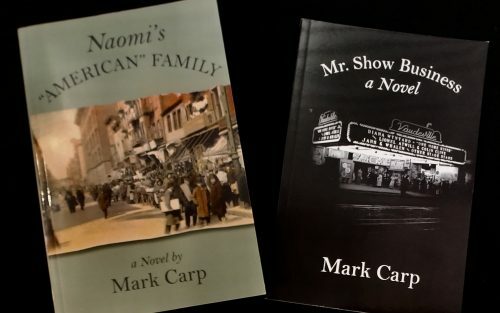 November is National Novel Writing Month and in celebration, we are delighted to feature Esther’s Place vendor and long-time JMM Member: Baltimore author Mark Carp. 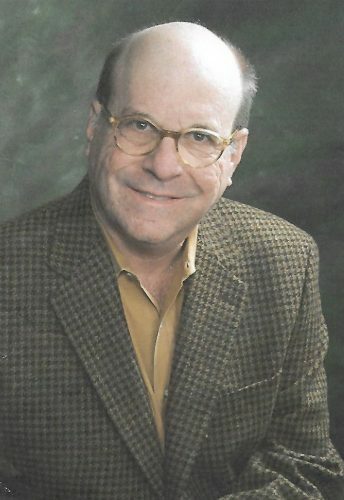 Carp has authored numerous novels that explore the complexities of individuals, relationships, and societies, and frequently take place in historical settings. Carp has written seven books (including six novels) and holds a bachelor’s degree in journalism from the University of Maryland and an MS degree from Johns Hopkins University. I recently met Mark Carp when he delivered his newest novel to the Gift Shop, a book titled Mr. Show Business. The book tells the story of former TV star Jackie Goldheart and his last chance at stardom via an unexpected family connection; this latest book follows another recent publication, Naomi’s “AMERICAN” FAMILY, which tells of two Jewish teenagers and their vast ambitions when they immigrate to the United States in the late nineteenth and early twentieth centuries. 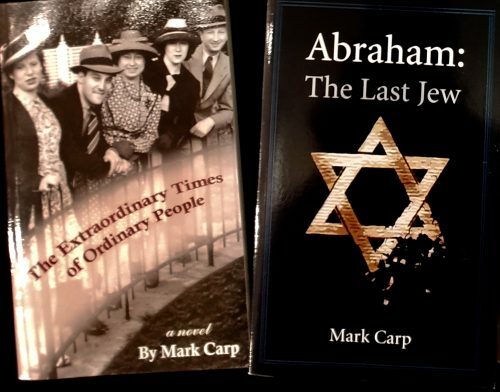 Other Carp titles found at Esther’s Place include The End of Hell, The Extraordinary Times of Ordinary People, Abraham: The Last Jew, and Segalvitz. I was intrigued to learn more about this Baltimore writer who enjoys turning his creative insight and lens onto Jewish culture and experience, and so I posed to him seven questions. Below is what I learned. I also asked for a little-known fact about Carp’s creative process. His fact: he doesn’t believe in fate, yet believes he was fated to write The End of Hell, a World War II novel about two Jewish soldiers who are among the liberators of Dachau. The End of Hell is available for sale at Esther’s Place. In addition to diving into a Mark Carp book, celebrate Novel Writing Month at Esther’s Place with two more novels recently featured at our public programs. On November 13, we held a book took with author Georgia Hunter, exploring her bestselling novel, We Were the Lucky Ones, and earlier this year, in July, we held an author program with Victoria Kelly, author of Mrs. Houdini: A Novel. Copies of both books are available at Esther’s Place. ← JMM Insights: Membership Looks Good On You!